Product review: Phillip Hopkins from Pontypridd – by Phillip Hopkins From Pontypridd, 14 Feb 15 5/5 Excellent "Found the Venue very easy to find, clean toilets and a little cafe area for refreshments. The flight instructor was very polite and a good laugh, his intructions were very clear and easy to understand. The whole experience from taking control of the aircraft to the thrill ride along the Swansea coastline was just awsome. I would definatly do this again in the new year (2013). The weather was not the best to hang around for a bit after but i did have a few photos which were taken by my girlfriend of myself in the helicoptor "
On arrival at the airfield you will have a short pre flight briefing with your instructor where s/he will answer any questions that you may have then out to the helicopter for the flight. During the 30 minute flight you will be introduced to controlling the aircraft and will actually be "on the controls" most of the time. All flight time does count toward any future licences being sought. 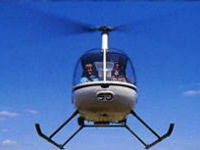 You will be learning to fly in the world's most popular training helicopter, the Robinson R22. Its superior performance, outstanding reliability and a safety record second to none have made it the most popular entry level helicopter for nearly 20 years. The student will have further opportunity after the flight to spend a little time with the instructor discussing questions he or she may have about helicopters or the flight. There is an observation area overlooking the airfield for family and friends.